The comparatively new 5 Star luxury Hotel Suites Alba Resort & Spa has 50 suites. It is located next to a quiet relaxing beach area to the east of the fishing village of Carvoeiro in the Algarve and away from other complexes. The Suites are composed of 47 Family Town House style Two-bedroom Suites and 3 luxury One-bedroom Ocean Suites. They are all furnished to a high standard in soft colour tones, each with a living area, bedrooms, kitchenettes, beautifully designed bathrooms, balcony or terrace, fire-places, flat screen TV, DVD, and luxury bedding of fine cotton and soft down quilts. The Ocean Suites are each equipped with a Jacuzzi. There is an outdoor sea-water pool for adults and children, and a children's playground and summer Kids Club. The 'Catedral dos Vinhos' is a spacious cellar beneath the restaurant stocked with a notable collection of fine Portuguese and foreign wines for tasting and also the space is used for events and special meals. There are two restaurants, the 'Sea Club' and the 'Morgadinho'. The latter offers a gourmet menu and fine-dining. The resort offers a range of Butler Services for guests. This also includes special gourmet meals within each suite with the final touches made by the chef within the facilities of the actual suite. Recently opened is the 'Lounge Zero' bar which is an attractive outside area during the season for the sunset drink or later! The SPA ALBA is a world of pampering! Complete with various high-tech facilities to provide a comprehensive range of treatments for guests of both gender. Classical in design, this Villa Suite consist of 2 bedrooms, 1 bathroom, 1 living room and dining room. Some Villa Suites contain a kitchenette, and all Villas have either terrace or balconies. Each suite features free wired internet, air-conditioning system, fireplace, and LCD TV. This suite can accommodate up to 4 adults and 1 child. This very spacious accommodation has wooden floors and furniture. It features a private balcony or terrace with views of the Atlantic Ocean. Each has 2 bedrooms, a lounge room with a fireplace, and a kitchenette. Please note that the price is based on 2 guests. Maximum occupancy is 4 adults and 1 child (see Hotel Policies). Located on 1st floor this suite is closer to the restaurant, pool and spa. Features elegant decoration and includes 1 bedroom and a spacious living room, a kitchenette, a bathroom with hot tub for 2 people and a separate shower. 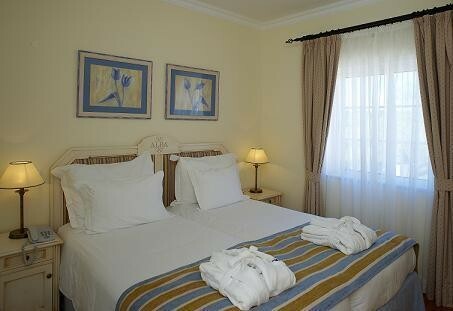 Includes dinner for 2 in the Morgadinho restaurant or a bath for 2 (Chocolate or Cleopatra) in the Alba Spa. Classical in design, this Villa Suite consist of 2 bedrooms, 1 bathroom, 1 living room and dining room. Some Villa Suites contain a kitchenette, and all Villas have either terrace or balconies. Each suite features free wired internet, air-conditioning system, fireplace, and LCD TV. 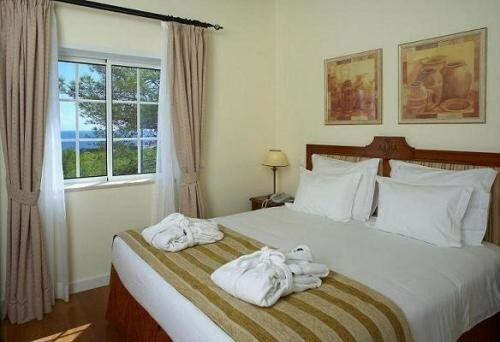 This suite can accommodate up to 4 adults and 1 child, and offers a scenic view of the garden. This room features air conditioning and a balcony. It has a fireplace and TV including a DVD player. Offers a kitchenette and minibar. This very spacious accommodation has wooden floors and furniture. 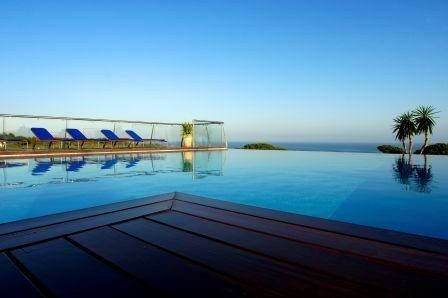 It features a private balcony or terrace with views of the Atlantic Ocean. Each has 2 bedrooms, a lounge room with a fireplace, and a kitchenette.